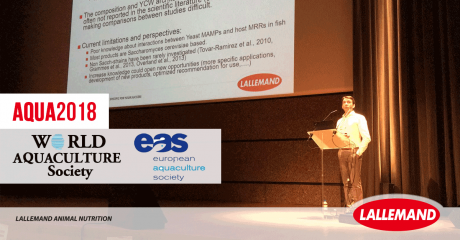 Lallemand Animal Nutrition revealed new results through five different presentations at the AQUA 2018 conference organized by the European Aquaculture Society (EAS) and the World Aquaculture Society (WAS). These studies contribute advancing our understanding of functional aquafeed ingredients to support fish health, performance and welfare. Functional feeds are becoming an essential component of modern aquafeed to support a responsible and high-performing aquaculture industry. The studies focused on the fish mucosal surfaces, which constitute an effective line of defenses but also are constantly exposed to a vast number of potential pathogens and non-infectious disrupting factors, such as physical transfer or chemical exposure during production. Specific functional ingredients can be selectively applied to support the physical, immunological, and microbial components of the fish mucosal barriers. First, an innovative analysis approach to immunomodulation studies in Atlantic salmon was developed in partnership with the University of Plymouth, UK. A high throughput real-time qPCR assay technique was specifically developed to follow the expression of 62 targeted genes implicated in mucosal responses, cell-mediated immunity, stress and humoral immunity. This unique genomic technology was designed to better understand, in particular, the immunomodulatory effects and downstream signaling cascades activated at the mucosal level with selected functional feed ingredients such as multi-strain yeast fractions and probiotics (1). Lallemand’s multi-strain yeast fraction formulation has already been proven to provide positive effects on bacteria binding, immune modulation and skin mucous secretion in a number of aquatic species (WO2017/005936). A separate salmon study presented at the conference showed Lallemand’s single-strain yeast fraction product has a positive effect on the skin mucosal barrier, resulting in lower susceptibility to an ectoparasite with no or positive effect on salmon growth (2). This highlights the potential of a natural dietary solution as a practical tool against sea-lice; in particular when considering its suitability for long-term application, which is expected to yield accumulated benefits against lice propagation over the rearing cycle. Studies also were conducted in other fish species with a multi-strain yeast fraction described for its positive effects on bacteria binding, immune modulation and fish skin mucous secretion. In rainbow trout, a trial carried out at the University of Plymouth revealed the supplement had a positive effect on mucosal barrier protection at the gut and skin level. Skin mucus level was around 30% higher with the yeast derivative. Moreover, gene expression analysis revealed a broad and balanced activation of the fish’s gut innate and adaptive immune responses improving our understanding of the specific immunomodulatory properties of the multi-strain yeast fraction tested (3). A trial on juvenile gilthead seabream using a multi-strain yeast fraction product showed a strong positive effect on skin mucus quantity and quality associated with, in particular, a significant up-regulation of selected mucin genes involved in physical integrity and protection against potential pathogens at the mucosal level. This study indicates the potential of this functional ingredient at mitigating pathogens and/or physical insults during challenging rearing or transfer periods (4). 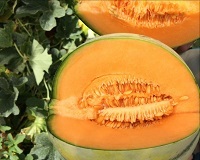 The final presentation looked at different kinds of functional feed ingredients, specifically a primary antioxidant source in the form of melon pulp concentrate naturally rich in the antioxidant enzyme superoxide dismutase (SOD). This ingredient was tested to determine if it enhanced the capacity of mucosal tissues to fight against oxidative stress in salmon (5). In Atlantic salmon, H2O2 baths are a common treatment against sea lice and amoebic gill disease. However, H2O2 is a powerful oxidizer documented to induce oxidative stress and associated mucosal damages. Following seven weeks of supplementation with SOD-rich melon pulp concentrate, endogenous expression of SOD enzymes were elevated in the salmon skin, indicating enhanced antioxidant defenses and confirming previous findings in other animal species. Following exposure to a standard H2O2 challenge, salmon skin SOD levels were higher when supplemented with the melon pulp concentrate. This new antioxidant source appears to have the potential to support the antioxidant defenses of Atlantic salmon not only under normal rearing conditions but also when subjected to H2O2 treatment. Development of a high throughput real-time qPCR assay technique for the targeted gene expression analysis of Atlantic salmon Salmo salar mucosal tissue responses. Nicola Pontefract, Mark Rawling, John Tinsley, Elizabeth Aasum, Mathieu Castex, Daniel Merrifield (Oral presentation). Effect of a single-strain yeast fraction on Atlantic salmon Salmo salar skin mucosal barrier and susceptibility to sea lice. Nicola Pontefract Eric Leclercq, Mark Rawling, Victoria Valdenegro, Mathieu Castex, Daniel Merrifield (Oral presentation). The effects of feeding a novel multi-strains yeast fraction on the mucosal immune responses of rainbow trout Oncorhynchus mykiss. Mark Rawling, Eric Leclercq, Andrew Foey, Daniel Merrifield, Mathieu Castex (Oral presentation). The effects of feeding a novel multi-strains yeast fraction on the mucosal responses of juvenile gilthead Seabream Sparus aurata. Mark Rawling, Arkadios Dimitroglou, Eric Leclercq, Daniel Merrifield, Dimitri Barkas, Mathieu Castex (poster). Stimulation of superoxide dismutase expression in the skin of Atlantic salmon Salmo salar receiving a SOD-rich melon pulp concentrate dietary supplement. Florence Barbé, Eric Leclercq, Julie Carillon, Kiron Viswanath, Mathieu Castex (poster). Abstracts and posters are available on request.